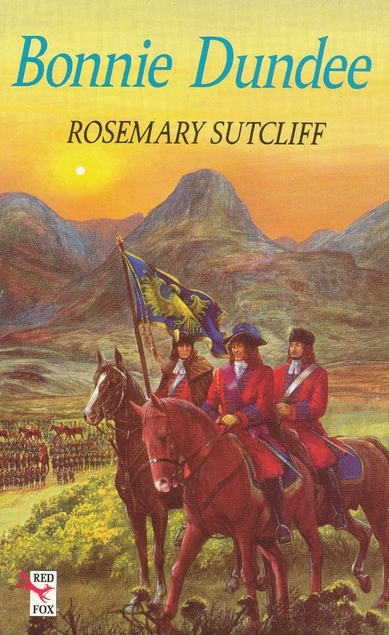 Bonnie Dundee by Rosemary Sutcliff was first published in 1983 and it’s a Puffin book. 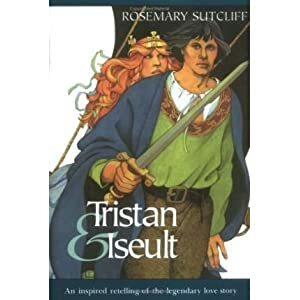 Previously I’ve enjoyed quite a few of Rosemary Sutcliff’s books for adults and I found this one to be well written and informative, very early on in the book I learned that a lorimer was a maker of spurs and horse accoutrements. I had just thought of lorimer as being a surname. Young Hugh Herriott is an orphan and is living in the Highlands with his mother’s family. His mother had more or less been cast off by her family as she had married a travelling artist against their wishes. Hugh’s grandfather had taken him back into the family but Hugh was very much an outsider, just tolerated by the rest of his relatives. It is a turbulent time in Scotland (when isn’t it?) and religious zealots in the shape of Covenanters are being hunted down by government soldiers. A close encounter with some redcoats makes Hugh realise that he’s happier on the side of the redcoats than with his Covenanting family. If you thought that ‘redcoats’ were always English think again, there were plenty of Lowland Scots in that army. In truth it’s seeing Claverhouse (Viscount Dundee) that pushes Hugh to leave his family and eventually he finds himself as part of Claverhouse’s household which leads him to follow him into battle. Things had come to a head when the Catholic King James succeeded to the throne on his brother Charles’s death. When James’s wife gives birth to a son the Protestants at court are determined to bring William of Orange over from Holland to push James out, William’s wife is a Stewart and of course they are Protestants. Some deluded people are still fighting this religious mess – it’s what has caused all the trouble in Ireland. So begins the Jacobite cause with James eventually legging it to France after Claverhouse or Bonnie Dundee as he was nicknamed pays the ultimate price. If you want to learn a bit of Scottish history painlessly then this is an ideal read, a bit of an adventure tale woven into historical fact, and very atmospheric. I’m fairly sure that Sutcliff’s mother must have been Scottish as she’s very good at writing Scots dialect, and her mother’s name was apparently Nessie – another clue I think. 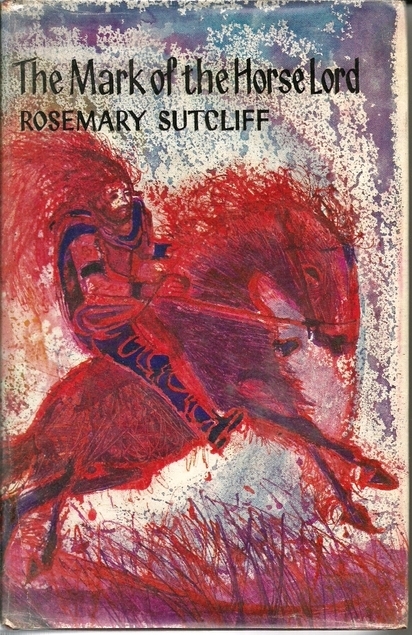 Rosemary Sutcliff spent most of her life in a wheelchair which makes her ability to write such great descriptive scenes all the more impressive as her own experiences must have been sadly narrow, especially as she lived at a time when access for disabled people was not great. This is one of those books that you continue to read, knowing what the outcome must be – but daftly hoping for a better one. We were in Edinburgh on Tuesday, right in the middle of the city – Princes Street, we don’t often go there but I wanted to visit the Habitat store. It was a bit of a shock to discover that Habitat has gone from Edinburgh, I knew the one in Glasgow had closed. I suppose we have the internet to blame for that, apparently it closed about five years ago and I’ve only just found out, so obviously they never made much money from me. Anyway, we rarely go to Edinburgh without visiting Stockbridge, the secondhand bookshops are far more my cup of tea than the shops in Princes Street, or Shandwick Place for that matter. Stockbridge is about a 20 minute walk from the centre of Edinburgh and it’s like a wee separate town, with lots of independent shops – and charity shops of course. You can see some images of parts of Stockbridge here. I was lucky bookwise as you can see. The Secret of the Old Clock by Carolyn Keene. The Marvelous Land of Oz by Frank Baum. I’ve yet to read The first Oz book although I have the second. Once Upon a Time by A.A. Milne. This book was first published in 1917 but my copy is a 1962 reprint. 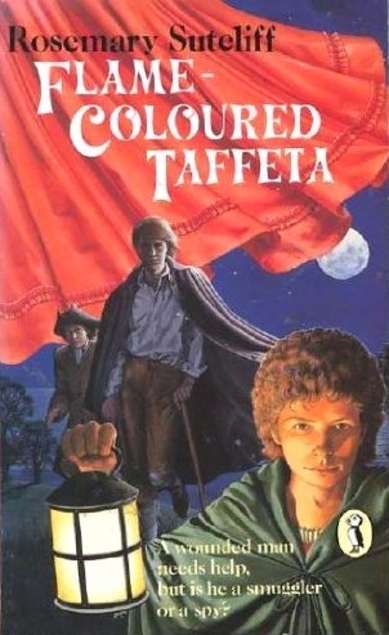 It’s a series of hilarious adventures apparently – involving a cloak of darkness, magic swords and seven league boots. It sounds like fun – for children of all ages. A Folly of Princes by the Scottish author Nigel Tranter is set in Fife where I live and involves some of the local castles and King Robert III, it should be interesting as although Tranter wrote fiction his books were well researched. Crime at Christmas by C.H.B. Kitchin was first published in 1934 but this one is a 2015 reprint by Faber and Faber. I’m going to keep this one fro Christmas reading. 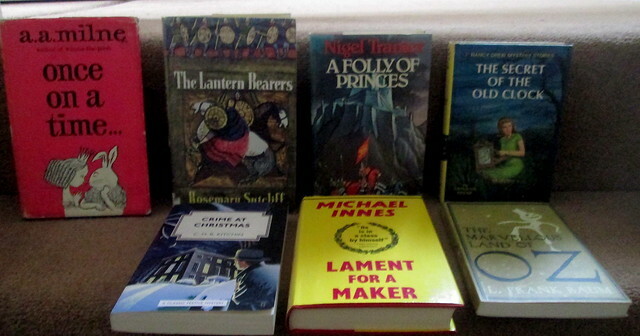 Lament for a Maker by Michael Innes – another Scottish author – was first published in 1938 and it was recommended to me by a blogger yonks ago. I have read a lot of his books, including the ones he wrote under the name J.I.M. Stewart and I always enjoy his writing. I think you’ll agree that I had quite a successful day in Edinburgh – despite not being able to do my planned shopping in Habitat. Amazingly, we actually went to the cinema in Dunfermline last night to see The Eagle which is based on the Rosemary Sutcliff book which I enjoyed reading years ago. Mind you it was SO long ago that I’m not sure how true to the book the film is. I don’t remember there being so much fighting and goriness but as that seems to be what most people want then they’re obviously going to add in as much as possible. It’s set in Roman Britain and Marcus Aquila has been given command of a fort on Hadrian’s Wall and he is determined to gain back his family’s honour which was lost when his father and the Ninth Legion which he had command of, disappeared along with their golden eagle standard. The only way he can do it is to find the standard and take it back to Rome. I quite enjoyed it but the battle scenes were so loud, they shook the whole place and it’s positively painful on my ears. Marcus and his slave Esca travel north into Caledonia/Scotland and some of the Scottish scenery is quite spectacular, the best part of the film for me really. It turned out to have a bit of a Romano-British Brokeback Mountain flavour to it, I think. We hadn’t been to the flicks for ages, since we saw Tamara Drew actually because we didn’t get around to seeing The King’s Speech. I think we’re the only people in the western world who haven’t seen it. We did try when it was at the wee local cinema but we couldn’t get in as everybody else had booked their tickets! You live and learn!